2K Games' E3 booth this year featured a grand total of zero games. 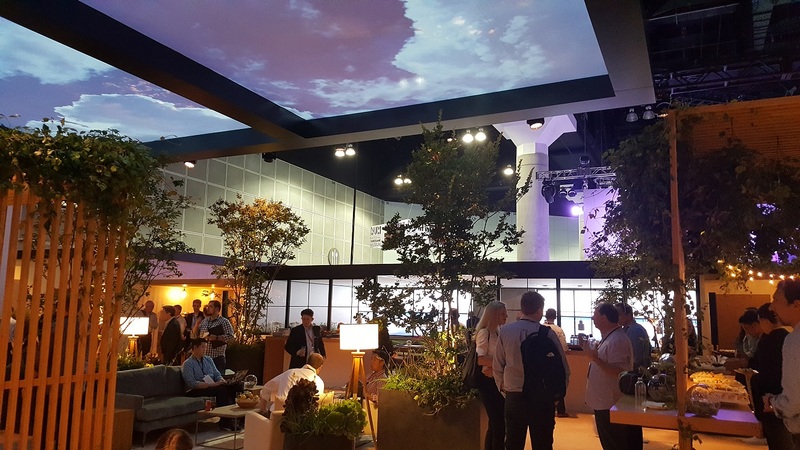 Rather than an open field of kiosks covered with promotional art of its latest titles, 2K's booth was a walled off oasis in the middle of a busy show floor, with plenty of seating, some greenery, complimentary sushi, and puffy white clouds projected across ceiling panels. Part of the decision behind the games-free environment was that it made for a great place to take a break from the hectic show, or perhaps even have a conversation, as 2K president David Ismailer did with GamesIndustry.biz. And part of the decision was that a 2K booth this year featuring its announced games would likely have been limited to the annualized sports titles NBA 2K19 and WWE 2K19. That's not likely to be the case at future E3s, as 2K is looking to grow in a big way. Ismailer laid out the publisher's three priorities for the coming years, the first of which is portfolio growth. The 2K booth at E3 2018. Not pictured: games. "We're looking to expand and grow our portfolio, whether it's internally developing more products, or it's adding more long-term partnerships to our 2K product line," Ismailer said. "We're looking for quality products to deliver to consumers with long engagement." The second part of the company's plan is pretty closely tied to the first: resource expansion. "We have more ideas than we have resources to execute on," he explained. "So I'd grow my portfolio a lot faster if I actually increased my capacity and added significantly more on the development resource side." "We're building our games [like an amusement park]. We need live events, we need post-launch content, we need to keep the consumer engaged once they get in"
Finally, Ismailer emphasized the need to keep players engaged with its games for longer. "I sometimes think of it as an amusement park," he said. "You go to an amusement park, the more rides they have, the longer you stay there. Then sometimes the amusement park has a nighttime event and I stay until that event; they keep me in there. And occasionally they build a new roller coaster, and I come back to experience that roller coaster. We're building our games in the same way. We need live events, we need post-launch content, we need to keep the consumer engaged once they get in." As for specific areas where 2K will be applying these general priorities, Ismailer described China and the mobile market as "huge priorities" for the company. It's also stepping up investment in the WWE 2K franchise, and hopes to broaden the offerings coming out of Firaxis. "We did Civ, then we did XCOM, and now we're looking hopefully to add one more to that portfolio," Ismailer said. And then of course, there's still the AAA business, where Ismailer said the company has a series of studios working on titles, including some external partnerships. That can be tricky, as the list of independent developers making AAA games over the last decade has not been a particularly lengthy one. And while 2K is clearly willing to work with studios who have established their AAA abilities (Gearbox has developed the company's Borderlands franchise, for example), it wouldn't rule out working with those looking to break into that scale of development. "Some independent developers actually want to stay their size, and then the question is, 'Can they produce a piece of AAA content with a partner studio to make a bigger AAA game?'" Ismailer said. "Some independent developers have had success, but then they're ready to take the next step. We're not going to force anybody into doing anything. They have to want to do it. The ability to deliver the highest quality content has to come from the development studio. If they're interested in growing and they don't have the opportunity to grow and want to work with us, we're happy to do it." When asked if the portfolio expansion was going against the "fewer, bigger, better" trend of publishers releasing fewer AAA titles and putting more money behind each one, Ismailer instead suggested it was necessary for the company to try new things. "I may want to be in a particular business, but unless there's an incredibly passionate development team that's got an incredible concept to deliver something amazing to the consumer, I don't have the ability to get into that category"
"We are comfortable with what we have and we're executing well on that," he said. "I think innovation is the key to future consumer engagement. I think it's really important we build new products with different kinds of experiences in order to engage new customers. Every time there will be a breakout hit; in order to [make] that, you can't just focus on what you have." And even though we both use the word "portfolio" frequently during the interview, Ismailer says the company isn't simply looking to produce games in big genres where it has no current offering. "We evaluate every opportunity versus looking at a portfolio," he said. "Obviously I wouldn't build another internal NBA game. But we look at the studio and what they want to create more than we do by saying, 'Let's go into this category.' Because chasing those categories? I may want to be in a particular business, but unless there's an incredibly passionate development team that's got an incredible concept to deliver something amazing to the consumer, I don't have the ability to get into that category." "Passion" is a clear keyword Ismailer returns to repeatedly when he talks about assessing potential partners and deciding which studios are right for which projects. "They have to be passionate about what they're making," Ismailer said. "There has to be incredible leadership with experience at the top. They have to be incredibly passionate, dedicated, and driven to make the best product. And that is the only thing we care about, if that team's got the vision, and the passion and experience to execute on that vision." As our interview time wound down, Ismailer also highlighted a new approach the company has taken with some executive hires recently. In November, it brought new COO Phil Dixon on board from online gambling outfit Betfair, and in April it hired senior vice president and head of global marketing Melissa Bell from a similar role at Infiniti Motor Company. "I think the gambling industry has an understanding of information way better than we do. And as we go into this digital space where we have an enormous amount of information, it's really important for us to understand what we do with that..."
"It's important for us to recognize that there are other industries that have gone through massive changes," Ismailer explained. "And as I think we are going into that space, we've decided to bring on additional talent from outside our industry in order to tackle those decisions." Ismailer's reference to "that space" seemed to be more in reference to a future shaped by new technologies and business models than the gambling or auto industries Dixon and Bell have respective experience with. However, he did acknowledge that 2K is "looking at" real-money gambling after a recent Supreme Court decision lifting a US ban on sports betting and esports betting. "We made the hire well before the [Supreme Court] decision, but I think the gambling industry has an understanding of information way better than we do," Ismailer said. "And as we go into this digital space where we have an enormous amount of information, it's really important for us to understand what we do with that information, and to get people who understand what the digital space is like. Melissa Bell comes from Asia; the entire Asian economy is digital. So as we bring in more people and we get to the point where we're absorbing that kind of ecosystem, we're going to have to make some tough decisions and we need really smart people to do that." Considering 2K parent Take-Two publishes the Grand Theft Auto franchise, Ismailer is aware that video games (even ones rated for adults) are accused of having a bad influence on children from time to time. However, he doesn't foresee too much pushback should the industry embrace esports betting. "If it's acceptable in sports, I'm unclear why it wouldn't be acceptable in gaming," Ismailer said. "I think the actual sport has the bigger issue. And the news is reporting that at least some sports leagues are in support of this. So if they're accepting of that, I don't see an issue in our space."